This leaflet is advertising Mason's Killcorn, a corn remedy. 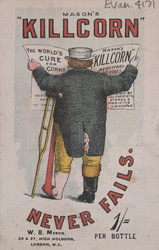 Corns were a fairly common affliction during the 1800s. Fashionable shoes were pointed, high heeled and decorative and although they looked stylish they did not fit people’s feet properly and as a result corns were widespread. There were many treatments, from rubbing it with castor oil, a bruised onion or with the leaves of a red geranium, to dissolving a false pearl in vinegar and rubbing the resulting cream on the corn. Perhaps Mason’s Kilcorn was a more successful remedy then these.